Why did Chookie LaCamera sign up for the U.S. Army in 1983, when he was a junior in high school? He entered the army after he graduated from high school in 1984. After Basic Training, Advanced Individual Training, and Jump School, he was assigned to the 2/504th Parachute Infantry Regiment, 82nd Airborne Division in Fort Bragg, North Carolina. He spent the rest of his four-year enlistment there, with various training deployments. One deployment was far more than a training exercise. When his commitment was up, Chookie got out of the army and joined the Pennsylvania Army National Guard in the usual one weekend a month, two weeks of summer training mode. He also worked as a civilian Federal Technician for the National guard, first as an administrative clerk; then he moved into logistics, and finally into communications in Pittsburgh. When his wife developed brain cancer, he had to get a job closer to home to take care of her and their three kids. He found a good job at Sawhill. But when his wife started getting better, he wanted to go into the National Guard full time. 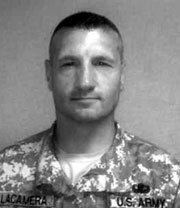 In 2005, he went back on active duty as retention manager with the 107th Field Artillery in New Castle. That same year he moved into logistics. In 2008, he became the battalion’s S-1 NCO. In civilian terminology, that’s human resources manager. Sgt. LaCamera is still in the National Guard quite simply because he loves the military, and knows he is performing an important function.